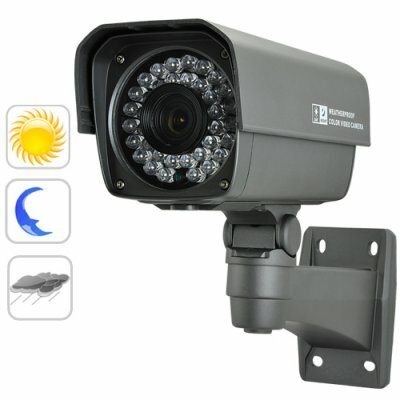 Successfully Added The Watchtower - CCTV Security Camera with SONY Interline CCD to your Shopping Cart. The best in home and business protection. This industrial strength waterproof night vision CCTV security camera with Sony Interline CCD video sensor produces high-quality surveillance footage day or night, rain or shine when you need the best in video security. The 1/3 inch SONY Interline CCD lens gives you a better image than other security cameras, because Interline CCD means that the quantum efficiency (QE) is increased, allowing more light to reach the CCD for extra image clarity along with noise reduction, thus further improving the quality of the image in low light environments. The Watchtower J23 has a heavy-duty aluminum casing protects this camera from water, stormy weather, falling debris, and even vandalism. It also has an adjustable sun shield which helps protect the iris from direct daylight as well as keeping the lens clean of mineral heavy raindrops. Installing and positioning this camera exactly where you want it is easy and takes a mere few minutes to completely install. All the wiring runs through the die-cast arm, making the whole system totally waterproof and capable of being mounted outdoors for many years without the need for any maintenance. We know what you must be thinking, "shouldn't a CCTV Security Camera this good be selling for at least $300?". You are right! However, with the exclusive Watchtower CCTV security camera, you are getting the same quality the Chinese Police and German Military use, but at a low factory-direct wholesale price. For maximum home and business security, start the new year with increased security and complete peace of mind, with the CVJZ-J23 Watchtower.